Synagogue attack: How did we get here? Jump to media player Following the latest violence in Jerusalem, BBC News looks back at the past few months of unrest. 'Chaotic scenes' after Jerusalem attack Jump to media player At least four Israelis have been killed and eight injured in an attack at a West Jerusalem synagogue. 'We heard a flurry of shots' Jump to media player A worshipper describes hearing a "flurry of shots" during an attack on a Jerusalem synagogue. 'Terrorists killed in gun battle' Jump to media player At least four Israelis have been killed and eight injured when two men armed with a pistol, knives and axes attacked a West Jerusalem synagogue, according to police. 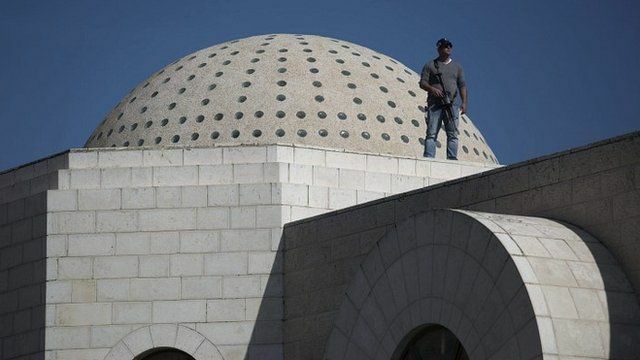 Hamas: 'Every day Jerusalem is boiling' Jump to media player Hamas spokesman Ghazi Hamad says people expected Tuesday's attack on a Synagogue because, "every day there is a crime against a Palestinian citizen". Kerry: 'An act of pure terror' Jump to media player John Kerry condemns a deadly attack on a Jerusalem synagogue as "an act of pure terror" and urges Palestinian leaders to "restrain any kind of incitement". Four Israelis have been killed and eight injured as two men armed with a pistol and meat cleavers attacked a West Jerusalem synagogue, police say. The attackers - Palestinians from East Jerusalem - were shot dead. The deadly attack comes after months of unrest and apparent revenge killings, as BBC News explains.